With RStudio v0.99, the code completion for R modes has been completely overhauled and vastly improved. This article outlines the new features. RStudio now uses ‘fuzzy narrowing’ on the completion list, by checking to see if the completion matches a ‘subsequence’ within each completion. By subsequence, we mean a sequence of characters not necessarily connected within the completion, so that for example, ‘fpse’ could match ‘file_path_sans_extension’. This is helpful when completing long variable names, or variable names that are difficult to remember. Good stuff. Could you please explain the meanings of the different icons? For example, data frames get listed twice the pop-up: once prefixed with the yellow rectangle and once with a box that looks like a worksheet. I presume it doesn't matter which a user chooses - but it could confuse beginners. I second Leon's question. What is the meaning of the different icons used in code-completion? I third the question. It is strange (and annoying) to see every option duplicated. I've added a simple symbol legend that should help explain what the various icons represent; in addition, the duplication of autocompletion symbols should be addressed in the next RStudio release. 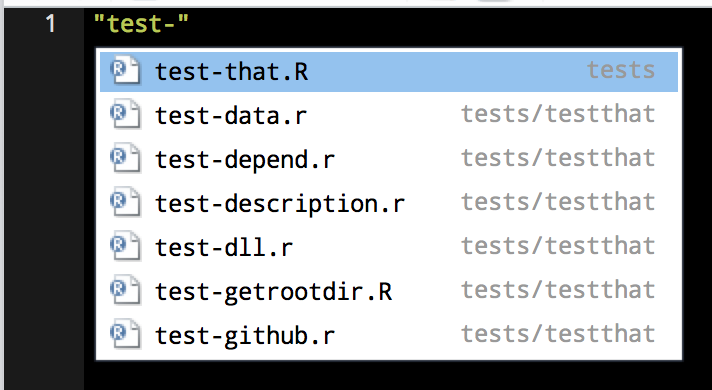 Is it a bug, or am I missing something obvious - my RStudio standalone installation (0.99.486) has stopped giving me auto-complete for data.frame names after the $. Auto-complete still works on my RStudio Server instance (same 0.99.486). Also, take the (sexist?) default "women" data frame, for example. 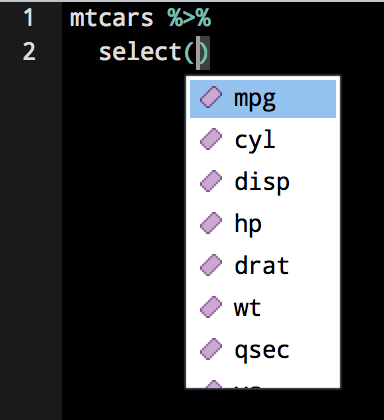 One thing that has confused me since this change to autocomplete is function arguments. Is there a way to turn back on the ability to see all of the arguments for a function? For instance, if I am using the format() function and I tab to autocomplete, all I see is the "x" and "..." parameters. 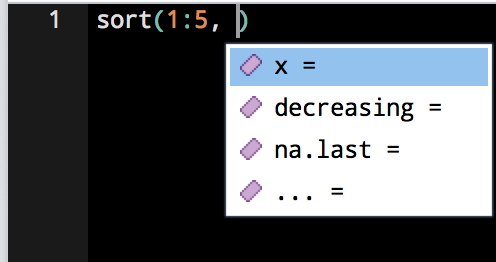 However, if I add an "x", like format(x = foo,) and tab after the "," I get 14 more possible parameters. There are also other cases where I get no arguments, usually when there are many variable names in the autocomplete. 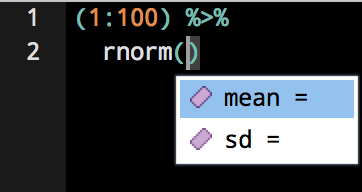 I really like the RStudio autocomplete, but have been having trouble with it since this change a couple years back. For one, it used to be very easy to see all the variable names and then select one without having to F1 into the documentation. Thanks!